[156 Pages Report] The consumer Identity and Access Management (IAM) market was valued at USD 13.45 billion in 2017 and is projected to reach USD 37.79 billion by 2023, at a Compound Annual Growth Rate (CAGR) of 18.8% during the forecast period. The base year considered for the study is 2017 and the market size is calculated from 2018 to 2023. 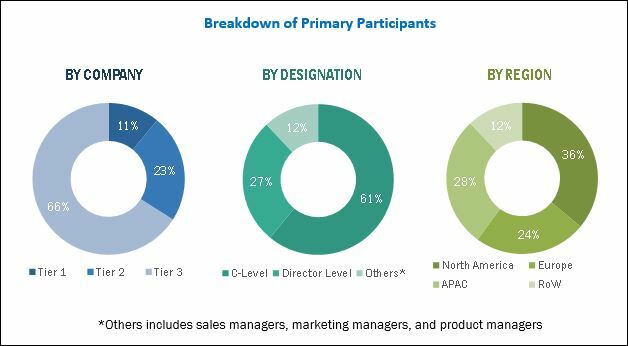 The objective of the report is to define, describe, and forecast the global consumer IAM market on the basis of solutions, services, authentication types, deployment modes, organization size, industry verticals, and regions. The report analyzes each subsegment with respect to the individual growth trends, future prospects, and contribution to the total consumer IAM market. Furthermore, the report profiles the key players of the consumer IAM market and comprehensively analyzes their core competencies in the market. The report also provides detailed information related to the major factors influencing the growth of the consumer IAM market, such as drivers, restraints, opportunities, and challenges. The research methodology used to estimate and forecast the consumer IAM market begins with the capturing of data on the key security technology vendors through secondary sources, such as The Open Group Identity Management Forum, Identity Management Journal, Information Systems Security Association (ISSA), Information Systems Audit and Control Association (ISACA), the SANS Institute, National Cyber Security Alliance (NCSA), TechTarget reports, Cloud Security Alliance reports, SC magazine, and other national agencies and associations for security technologies, as well as other sources, such as company financials, journals, press releases, and annual reports. The vendor products and services offerings are also taken into consideration to determine the market segmentation. The bottom-up procedure was employed to arrive at the overall market size from the revenue of the key players in the market. After arriving at the overall market size, the total market was split into several segments and subsegments, which were then verified through primary research by conducting extensive interviews with the key people, such as CEOs, VPs, directors, executives, and security technologists. The data triangulation and market breakdown procedures were employed to complete the overall market engineering process and arrive at the exact statistics for all segments and subsegments. The breakdown of the primary profiles is depicted in the below figure. The consumer IAM ecosystem comprises major vendors, such as IBM (US), Microsoft (US), Salesforce (US), SAP (Germany), Okta (US), CA Technologies (US), Janrain (US), Ping Identity (US), ForgeRock (US), LoginRadius (Canada), iWelcome (Netherlands), GlobalSign (UK), Trusona (US), SecureAuth (US), WidasConcepts (Germany), Acuant (US), EmpowerID (US), Onegini (Netherlands), Pirean (UK), Auth0 (US), Avatier (US), Ergon (Switzerland), ManageEngine (US), Simeio Solutions (US), and Ubisecure (Finland). Other stakeholders include cybersecurity solutions providers, consulting firms, Information Technology (IT) services providers, value-added resellers, and distributors. The consumer Identity and Access Management (IAM) market size is expected to grow from USD 16.00 billion in 2018 to USD 37.79 billion by 2023, at a Compound Annual Growth Rate (CAGR) of 18.8% during the forecast period. The major growth drivers of the consumer IAM market include the growth in the concern to manage consumer identity, rise in the adoption of Internet of Things (IoT) and smart devices, and need for compliance with the regulations for identity management. The consumer IAM market is segmented by solution, service, authentication type, deployment mode, organization size, industry vertical, and region. The identity authentication segment is estimated to contribute the largest market size in 2018, as it is used to verify and authenticate the identity of consumers for web-based businesses to deliver a seamless consumer experience. Furthermore, the identity analytics segment is expected to grow at the highest CAGR during the forecast period, as it provides a real-time understanding of consumer identities through a combination of big data and advanced analytics capabilities to enhance the consumer experience. Owing to the low-cost and anytime-anywhere availability of consumer IAM solutions, cloud-based deployment mode is mostly adopted by enterprises, and this deployment mode is expected to grow with a higher CAGR than on-premises deployment mode during the forecast period. Some of the regulated industry verticals, such as Banking, Financial Services and Insurance (BFSI) and public sector, in the developing economies, are deploying on-premises-based solutions, but these industry verticals are also expected to migrate toward cloud-based consumer IAM solutions in the upcoming years. Consumer IAM solutions have also been deployed across various industry verticals, including public sector, BFSI, telecommunications, and healthcare. The healthcare industry vertical is expected to witness the highest CAGR during the forecast period, as advanced identity management helps healthcare providers manage and validate consumer identities. However, the BFSI industry vertical is estimated to have the largest market size in 2018, which is fueled by high investments in the BFSI infrastructure to provide a secure and seamless consumer experience. 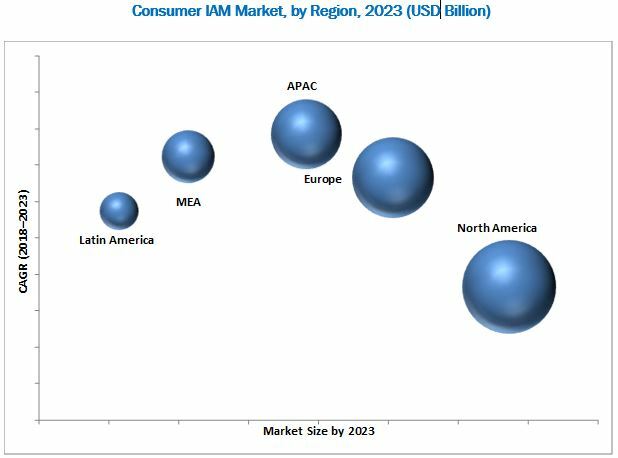 The consumer IAM market is also segmented on the basis of regions into North America, Europe, Asia-Pacific (APAC), Middle East and Africa (MEA), and Latin America to provide a region-specific analysis in the report. North America is estimated to become the largest revenue generating region for consumer IAM vendors in 2018, followed by Europe. In the US, identity thefts highly target businesses, thus the need to meet compliance requirements for ensuring consumer identity protection act as a driving factor for the adoption of consumer IAM solutions in this region. APAC is expected to be the fastest-growing region in the consumer IAM market, due to the high adoption of IAM solutions in the high-growth APAC countries, such as China, India, Australia, Japan, and Singapore. The limitation from traditional enterprise IAM solutions for ensuring privacy and providing scalability, and the collection of the consumer data distributed across multiple locations within a business are the biggest challenges in the consumer IAM market. Major vendors that offer consumer IAM solutions across the globe are IBM (US), Microsoft (US), Salesforce (US), SAP (Germany), Okta (US), CA Technologies (US), Janrain (US), Ping Identity (US), ForgeRock (US), LoginRadius (Canada), iWelcome (Netherlands), GlobalSign (UK), Trusona (US), SecureAuth (US), WidasConcepts (Germany), Acuant (US), EmpowerID (US), Onegini (Netherlands), Pirean (UK), Auth0 (US), Avatier (US), Ergon (Switzerland), ManageEngine (US), Simeio Solutions (US), and Ubisecure (Finland). These vendors have adopted different types of organic and inorganic growth strategies, such as new product launches, partnerships and agreements, and mergers and acquisitions, to expand their offerings in the consumer IAM market. Consumer IAM solutions makes it easy to manage customer identities and provides omni-channel access management for banking customers and prospects across devices and channels, ensuring compliance with regulatory standards. CIAM ensures seamless customer experience by offering real-time fraud management and simplifies customer provisioning.